Where to Buy Pendulum 2G, Pendulum 2G Herbicide Pendimethalin - 40 Lb - $94.45 for Sale with Fast Free Shipping! 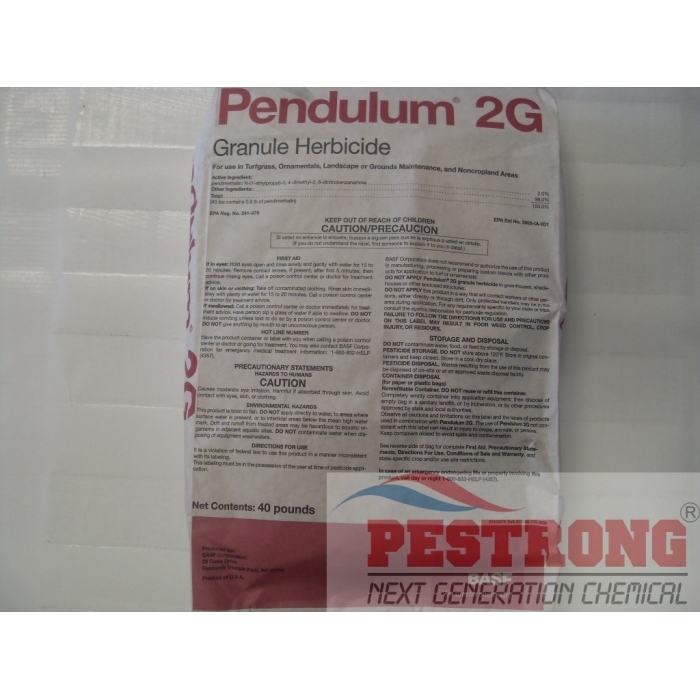 Pendulum 2G Herbicide Pendimethalin - 40 Lb controls more than 40 grassy and broadleaf weeds in all — including troublesome weeds like oxalis, henbit and spurge. Delivers unbeatable overall preemergent control of troublesome weeds including crabgrass, goosegrass, oxalis, henbit, spurge and nearly 40 other broadleaf and grassy species. Controls weeds as they germinate. Offers more control for your money (less expensive than other premium-priced brands). My experience with Pestrong.com has been wonderful. Good product (Pendulum), great price, fast service, and free delivery - it doesn't get any better than that. I would definitely recommend Pestrong to a friend. bought many products and the products and prices are great! I have used this before and really enjoy it, because it does not leave yellow stains. Excellent product.